It can be difficult to measure the exact return on investment (ROI) of your social media marketing, but you will see residual effects of your efforts. This post also includes a tutorial on how to use Google Analytcs to track you ROI. Your social media channels are the face or your company. Your customers may look into you on social media before making a purchase, attempt to ask you a question or simply use it to learn more about you. While tracking teh exact ROI of social media isn’t an exact science, the below will give you some idea. – Coupons and Offers – You can post a coupon on your social media channels as well as an Offer. Facebook recently announced that they are doing away with offers as the conversion rates on those are not high. – Tracking Phone Numbers – You can implement tracking phone numbers that will be attributed to your social media channels. You should receive a report as to how many calls came to you through those numbers. – Google Analytics – Google Analytics is a powerful tool that allows you to measure web traffic and the sources it comes from. 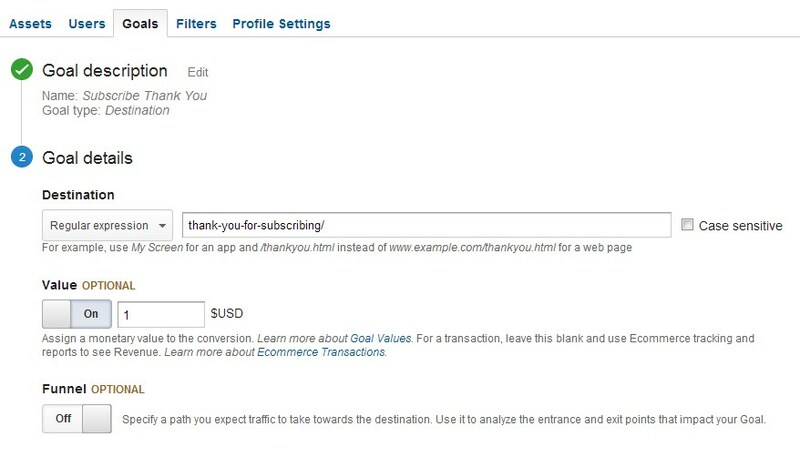 You can set up goals on your Thank You pages and attribute that traffic from a social media site. Below is a simple Google Analytcs Tutorial to track Return on Investment of social media. Currently, I am trying to build my subscriber list. I use Google Analytics to track which articles earn me the most subscribers, which allows me to optimize my website and concentrate on those subscribers as potential customers. – Click the admin button at the top right. There are different types of goals that you can setup. In this case, we are going to set up a destination goal. You can choose any name that you like. One you have chosen a name and selected destination, hit next. This goal will measure how many visitors end up on your Thank You Page or Success page. The destination in this example measures every time someone hits that page. The only way they can hit this page is if they subscribe to my blog. You can also assign a monetary value to to this goal. – When you are done filling out this portion hit create goal. You should see a list of traffic sources in the main window. You can measure any traffic source that you like, but for this example, we’ll look at Facebook. Type in Facebook in the search box to the right. It should come up with Facebook and Facebook Mobile. You can also Set the date range for the dates you would like to measure at the top right of the entire window. I am measuring Jan 1, 2013 – June 12, 2013. Now that we are drilled down to all the web traffic from Facebook, we can look at our goal. 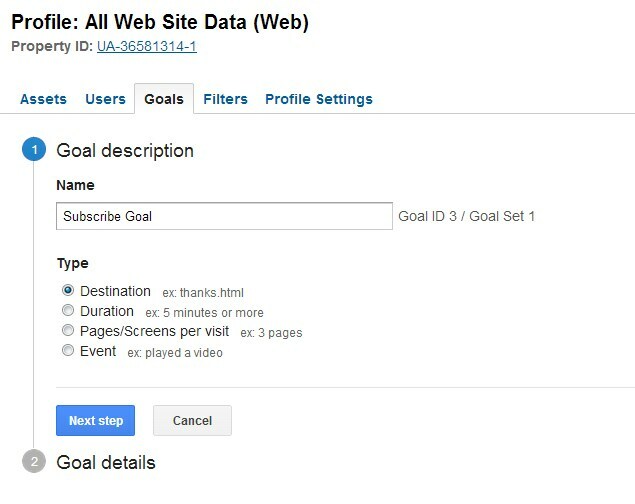 After Clicking Goal Set 1, you’ll see a new column with all your goals. The Subscribe Goal, which is the one i set up for our test and the goal I already had in place, which is the Subscribe Thank You Goal. To drill down to which specific pages or posts earned you the most subscribers, you can so just that. The below view is of all the landing pages that have earned me a subscriber. Remember, this is just for those who subscribed to my blog after coming to it from Facebook. This allows me to see what type of posts I should be writing to earn me subscribers. Whenever I have run a contest, that is when the most people subscribe. Instead of measuring subscribers, you can use this same tactic to see if someone bought something from your website. Your goal URL would be the checkout page. 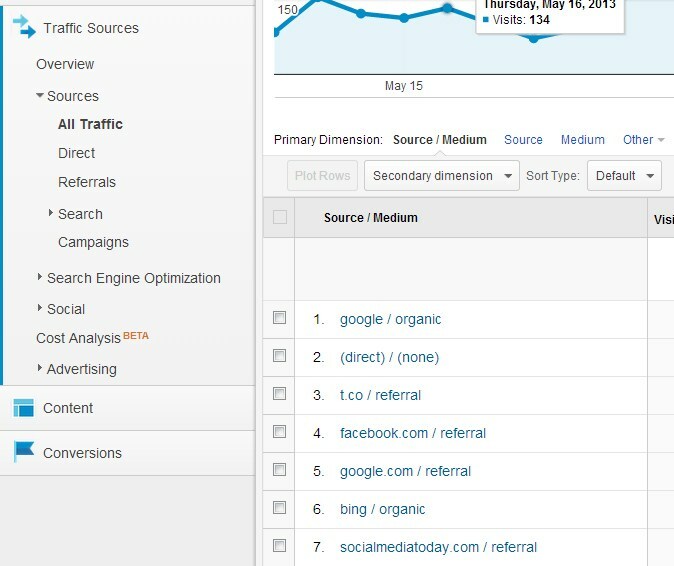 This is how you use Google Analytics to measure your social media return on Investment.